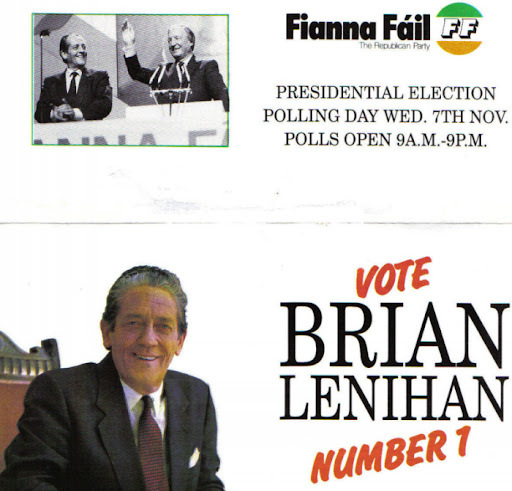 In 1990 Brian Lenihan was the favourite for the Presidency…… Pee Flynns championing of stay at home mothers, the “on mature recollection” statement about phone calls in 1982 and other happenings led to the loss of the Presidency for the first time ever by Fianna Fail. Mary Robinson became our first female president. It also ended Lenihans Ministerial career as the PDs called for his head on a plate…. and Charlie duly obliged.. 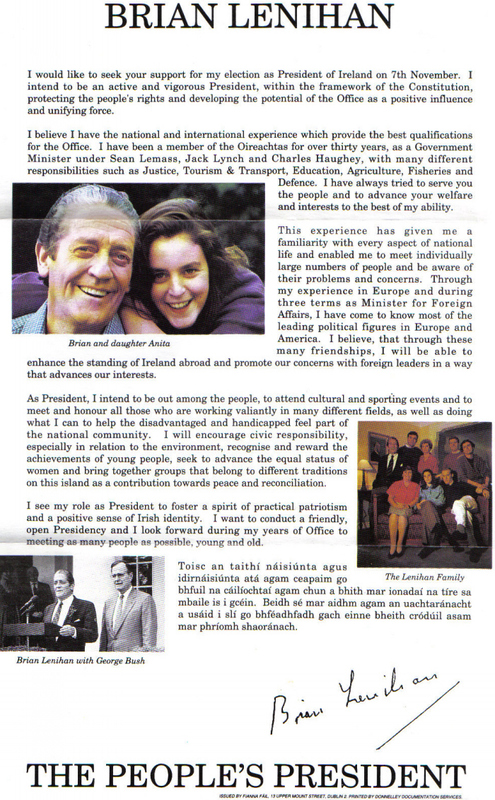 The Below doc has a lovely photo of Lenihan lovingly gazing at Haughey…. the man who would sack him months later. In the family photo you may spot Conor Lenihan with hair and a young Brian junior amongst others. That final sentence, “I want to conduct a friendly open presidency and I look forward during my years of office to meeting as many people as possible”, it vividly conveys the sense of entitlement to the office by FF, no sense of doubt that it might not come to pass, that the people just might not elect him. Such arrogance. Wonderful stuff. Yes that was the thing, it was assumed that like every Fianna Fail Presidential candidate before him he would be elected….. and then came the downfall. Yet we forget that he polled 44% , someone who had ‘told untruths’ on National Television and been sacked in the course of the campaign still got over 44% of the vote!